Mutations of several genes that are involved in Na/fluid reabsorption along the distal nephron are the cause of tubular disorders that are characterized by chronic hypokalemic alkalosis and normotensive, hyperreninemic hyperaldosteronism, including Gitelman syndrome (GS; OMIM 263800) and Bartter syndrome (BS) types I to V (1–3) (OMIM 241200, 601678, 607364, 602522, and 601199). Chronic normotensive hypokalemia and alkalosis may also be acquired as a result of known or unknown diuretic use, anorexia/bulimia, and laxative abuse (4–6). Clinical history and biochemical workup may not allow definite diagnosis, especially concerning the different types of tubular disorders. Genetic diagnosis is now feasible for all known genes that are responsible for GS and BS, but in everyday practice, it remains not easily available for the clinician and, for the geneticist, costly, cumbersome, and time-consuming as a result of the great dimension of most genes, lack of hot-spot mutations, and the very large number of mutations described. Furthermore, in approximately 40% of patients with GS, only a single heterozygous mutation in the SLC12A3 gene is detected (7), so further examination of a second gene is usually necessary. Tests with diuretics have been used in the past to diagnose tubular disorders (8–12) and nontubular conditions (5); however, genetic confirmation of the supposed diagnosis was rarely, if ever, available. We present the diagnostic yield of a test with the thiazide diuretic hydrochlorothiazide (HCT) in a large cohort of patients with genetically proven GS and BS types I and III and in three additional patients with nontubular chronic hypokalemia. The results indicate that the thiazide test may correctly characterize most patients with GS and thereby reduce the need for genetic testing in a substantial fraction of patients. A total of 51 patients were studied; all had chronic normotensive and hyperreninemic hypokalemia of uncertain origin, and their final diagnosis was GS in 41 patients, BS in seven (type I in five, type III in two), surreptitious diuretic use in two, and alimentary disturbance (vomiting) in one. They were studied and followed up at two adults’ hospitals in Milan and Varese and two children's hospitals in Milan and Merate, all in Italy. The diagnosis of GS and different type of BS was supported by genetic testing, disclosing significant mutations of pertinent genes in homozygous or compound heterozygous state (Tables 1⇓ through 3). Seventeen patients (15 with GS and two with BS) with a single heterozygous, nonpolymorphic mutation and consistent phenotype were also included, because it is not uncommon, at least in GS, that the second mutation is missed (7). Exclusion of heterozygous cases would not change the results and interpretation of data. Genetic testing was carried out on genomic DNA from peripheral blood cells according to published methods for the SLC12A3 (13,14), SLC12A1 (15), CLCNKB (16,17), and KCNJ1 (18) genes. Some patients (the earliest cases) underwent a mutational screening by means of single-strand conformational polymorphisms analysis, and when an abnormal migration pattern was observed, a sequence was performed on the coding region and its intron-exon boundaries. More recent patients were defined only by direct sequencing. The gene that was most likely to account for the phenotype in individual patients was analyzed first (SLC12A3 for Gitelman phenotype, SLC12A1 and/or KCNJ1 for “antenatal” Bartter phenotype, and CLCNKB for “classical” Bartter phenotype without nephrocalcinosis); however, in the case of negative results or of heterozygous mutations for the candidate gene and in the presence of strong clinical suspicion, other pertinent genes also were evaluated (CLCNKB in both Gitelman and Bartter phenotype and the untested gene in Bartter phenotype). No genetic study was performed in the three patients with nontubular disorders. All of the patients were studied either as outpatients (mostly adults) or as inpatients (mostly children-adolescents); at least a daily urine collection was performed on an unrestricted diet for electrolyte excretion, and fasting plasma levels were taken in the morning. A washout period of at least 7 d was allowed between withdrawal of any therapy and both general biochemical evaluation and thiazide test; however, oral KCl and Mg salts (any dosages), when already in use, were maintained or stopped the day before the test. The thiazide test (HCT test) was performed as described previously (10); in brief, after an overnight fast, the patients were kept recumbent for 4 h and were invited to drink tap water (10 ml/kg body wt) to facilitate spontaneous voiding. After two 30-min “basal” clearances, 50 mg of HCT (in adults and older adolescents) or 1 mg/kg body wt (in children) was administered orally, and six additional 30-min clearances were performed. Blood samples (for measurement of Na, Cl, K, and creatinine as GFR marker) were taken at times 60 and 240 min, and urine was collected every 30 min by spontaneous voiding and analyzed for Na, Cl, K, and creatinine. A simplified quantification of the diuretic effect was performed by choosing maximal increases of urine electrolyte excretion over mean basal levels (i.e., maximal excretion at any time minus the mean of the two basal clearances) as the test result. For accounting for possible incompleteness of urine collections, electrolyte excretion was evaluated as fractional excretion (FE; with creatinine as a GFR marker) rather than quantitative terms (10). Reference values for biochemical parameters were from our laboratory's data on the healthy general population on unrestricted diet; control results for the HCT test were from 12 healthy people aged 13 to 61 yr. All adult patients and one parent of patients who were younger than 18 yr gave their informed consent to all of the procedures considered for the diagnostic workup. Unpaired t test was used to disclose significant differences (with P ≤ 0.05) in biochemical data between the groups; relationships between parameters were evaluated by correlation analysis using a computer program. Individual clinical and genetic patient data are shown in Tables 1 through 3, general biochemical group profile is shown in Table 4, and group thiazide test results are shown in Table 5 (where the prefix “B” denotes patients from the children's hospitals). Data from several patients have already been described (13,14,19,20); there were three brother/sister couples (patients 16 and 17, 19 and 20, and B20 and B21). 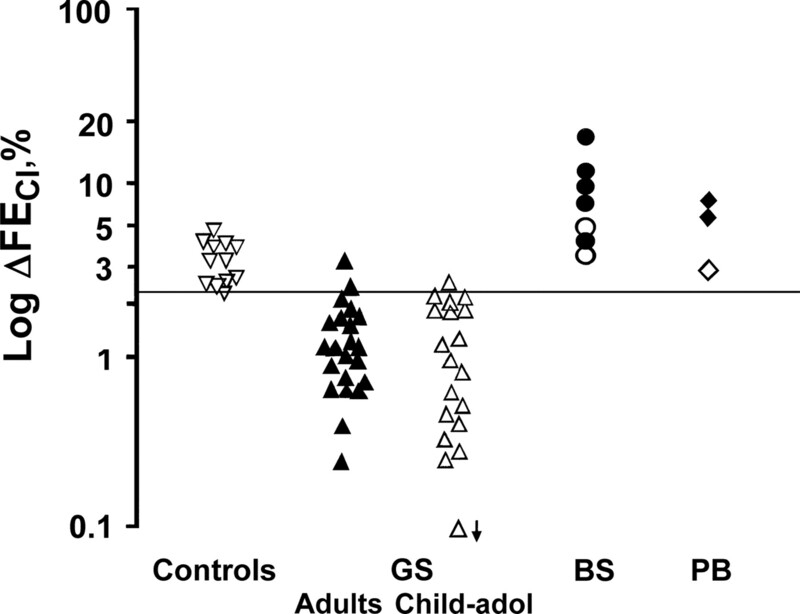 Patients with GS are divided into two separate groups according to age (i.e., 22 adults, >18 yr; and 19 children-adolescents, <18 yr). This is because most of the latter were seen in the children's hospitals and performed the HCT test with <50 mg of the diuretic; moreover, the two groups did not differ as for biochemical data, pattern of mutations, symptoms, and response to HCT test (Tables 4 and 5, and Figure 1). Patients with mutations in Henle's loop genes (SLC12A1 and CLCNKB) were analyzed together (BS group); because of the small number, no age differences were considered. The three patients with nontubular hypokalemia (PB) were three women with surreptitious diuretic use (two patients: furosemide by biochemical screen and self-admission) and postalimentary vomiting (one patient, self-admission). The diuretic HCT test in these patients had been planned because of previous diagnosis of tubular disorder elsewhere or diagnostic uncertainties. In our cohort of patients, the majority of mutations in SLC12A1, SLC12A3, and CLCNKB genes were point mutations (missense, nonsense splice site, and small deletions/insertions). No hot spot could be identified. All of the variants found were considered to be loss-of-function mutations: 28 (on a total of 76 mutated alleles found) were splice-site mutations, nonsense, and frameshift, leading to a stop codon, and the remaining missense mutations in 48 mutated alleles were either previously published as inactivating mutations or are novel variants targeting on amino acids that are conserved among the species. None of the novel mutations were found in 100 control chromosomes. Major biochemical differences between groups were lower creatinine clearance in PB, lower plasma magnesium levels in GS (both adults and children-adolescents), higher sodium and chloride daily urine excretion (representing more abundant dietary intake in an adult population) in adult GS, reduced urine Ca excretion (as daily UCa/UCr ratio) in GS (both adults and children-adolescents), and increased Ca excretion in BS. In individual patients, plasma Mg was normal (>1.6 mg/dl) in 15 patients with GS (six adults and nine children-adolescents), in all but two patients with BS (one BS type I and one BS type III), and all three patients with PB; urine Ca excretion (as daily UCa/UCr ratio) was >0.07 mg/mg (a conventional definition of “normocalciuria”) (21) in 10 patients with GS (seven adults and three children-adolescents), all three patients with PB, and all but one patient with BS (type III, with a low 0.04 UCa/UCr ratio). In remaining six patients with BS, UCa/UCr was higher than the higher normal limit of 0.20. Group results of HCT tests are shown in Table 5, and individual data of maximal FeCl changes (ΔFECl) are shown in Figure 1. Patients with GS but not BS and PB had blunted diuretic effect as indicated by much lower sodium and chloride postdiuretic urine excretion and maximal increase, as already reported (8–10). The chloruretic effect was higher than the natriuretic effect, this difference having traditionally been explained, in clearance studies, by greater Na than Cl reabsorption in tubular segments past the site of the diuretic action (22). For this reason, Cl data are usually preferred to Na in diuretic-based clearances (5,8–10,23); however, as regards this study, there were minor qualitative differences in data results and interpretation considering Na rather than Cl clearance results. Considering a maximal diuretic-induced increase (Δ) of FECl of 2.3% (the lower observed value in control subjects) as the lower normal response, all but three patients with GS (two adults and a 10-yr-old boy) had lower than normal ΔFECl values; all patients with BS and the three patients with PB had higher ΔFECl than 2.3% (range 3.10 to 17.68%), with mean levels statistically higher than in control subjects (Table 5, Figure 1). In four patients with BS and the two patients with PB from diuretic abuse, ΔFECl was above the maximal level in control subjects of 5.36%. The remaining three patients with BS and normal ΔFECl were the two patients with BS type III and a patients with BS type I with only a heterozygous mutation (Figure 1). This latter 11-yr-old girl did not have mutations in the KCNJ1 gene and had a typical phenotype of “antenatal” BS with polyhydramnios, preterm birth, and early-onset nephrocalcinosis; therefore, the diagnosis of BS type I was maintained despite that a second SLC12A1 mutation was not found. The three patients with GS and normal HCT test results were either compound (one patient) or single (two patients) heterozygotes. Most notable, there was almost no overlap between GS and BS: Only one patient with GS had a very high, seemingly unexplainable, ΔFECl of 3.6%; we could not repeat the test in this patient to exclude possible laboratory errors. The other two patients with “normal” HCT test had a ΔFECl at the lower normal limits, respectively 2.55 and 2.60%. Diagnostic sensitivity of ΔFECl (<2.3%) was 38 (93%) of 41, and specificity was 100%. Of note, close results were observed in the three brother/sister couples: ΔFECl was 0.65% in both patients 16 and 17, 1.1 and 0.8% in patients 19 and 20, and 0.53% and 1.27% in patients B20 and B21, respectively. There were no significant correlations between ΔFECl (independent variable) and plasma K and Mg levels or urinary Ca excretion (dependent variables) in any group of patients or control subjects. There were no adverse symptoms to diuretic test in any patient or control subject; compliance with urine collection was excellent, so the test could be correctly performed, always with spontaneous voiding, also in children as young as 7 yr old and, with a parent's aid, in a 4-yr-old girl. Genetic testing has become a powerful means to diagnose individual entities of the group of monogenetic tubular disorders that present as chronic normotensive, hyperreninemic hypokalemia and alkalosis. Most of the genes responsible, when inactivated by mutations of specific abnormalities of tubular solute reabsorption that underlie each of these conditions, have been defined, allowing definite molecular diagnosis (13,15,17,18,23–26). Despite these premises, genetic diagnosis of hypokalemic disorders still remains largely confined to a few laboratories that specialize in rare diseases far away from the clinic. Furthermore, genotyping turns out to be complex and time-consuming for several reasons: Most genes of interest have huge dimensions (spanning from five exonic regions for ROMK to 26 exons for SLC12A1 and SLC12A3); the number of recognized mutations in each gene is very large and evenly distributed along the whole gene without any hot spot, requiring long and costly sequencing procedures in every sample for their demonstration; or several mutations (mostly in SLC12A3 gene) are still missed, likely as a result of their localization in the unknown regulatory regions or of complex mechanisms such as silent polymorphisms that lead to exon skipping (27). In addition, there exists a clinical overlap between individual disorders, so negative workup for a gene does not exclude mutations in other genes. As an example, phenotypic overlapping is widely known between patients with mutations in CLCNKB and SLC12A3 genes and between mutations in all BS-causative genes (2,16,28,29). Intrafamilial heterogeneity in phenotypic expression of a same mutation is also well described (29,30). Therefore, precise phenotypic characterization of individual tubular disorders may greatly help restrict the genetic workup; however, traditional parameters, such as age, plasma Mg, and urine Ca excretion, lack specificity. Fifteen of our 41 patients with GS had normal plasma Mg, and 10 had “normal” (although arbitrarily defined) Ca excretion. Of our seven patients with BS, one patient with BS type III had low Ca excretion and two had hypomagnesemia. Another confounding factor is that the same electrolyte and hormonal profile may result from a genetic disease or an acquired, still unapparent, cause, such as diuretic intake, bulimia, or gastrointestinal losses; although a suggestive urinary electrolyte profile may be a clue (4–6), general phenotypic profile may be difficult to differentiate from tubulopathy. We have seen that blunted natriuretic and chloruretic response to HCT correctly recognizes GS from BS and from PB from concealed loop diuretic use and vomiting. The test is very simple to perform and interpret, has very high sensitivity and specificity, and may substantially improve the phenotyping of tubular hypokalemic disorders. As an example, Table 6 shows two representative patients with “ambiguous” phenotype in which diuretic test suggested the correct final diagnosis. Diuretic challenge was historically used to characterize the tubular site and underlying cause(s) of hypokalemic tubular disorders (8–12), and differential response patterns in different patients had allowed anticipation of a different molecular background for these disorders and their genetic heterogeneity. Individual hypokalemic tubular disorders are in fact a natural model of chronic administration of diuretics of different classes (2). Because diuretics of individual classes exert their effect by selectively interacting with specific tubular transporters/channels (31), it is a logical expectation that abnormal functional activity of their target proteins results in parallel changes in pharmacologic response. Our results confirm that diuretics may allow selective evaluation of individual tubular transporters in clinical practice and that this information may translate into reliable diagnostic results. All but three patients with proved mutations in the SLC12A3 gene were expected to have impaired function/activity of the thiazide-inhibitable Na-Cl co-transporter, but none with mutations of transporter/channels not inhibited by thiazides or without genetic disorders showed blunted HCT response. There was a wide variability in diuretic response in GS, from completely abolished to near normal, suggesting corresponding variability in functional equivalence of underlying mutations. Close responses to the diuretic were observed in at least two of the three pairs of brother/sisters, an indirect confirmation that the test result is a measure of the degree of functional impairment of the transporter. There was some overlap in diuretic effect between healthy individuals and GS, suggesting that the HCT test, in this simplified protocol, may not be a precise measure of the thiazide carrier activity “in vivo.” Alternatively, the activity of the thiazide carrier may undergo modulation by physiologic factors (e.g., volume status, dietary Na intake, filtrate delivery to the distal convoluted tubule) that were not taken into account by our protocol. Most important, there was a fair differentiation, by HCT test, between types of tubular disorder (patients with a distal convoluted tubule defect [GS] and those with Henle's loop defect [BS in a broad sense]). Therefore, if confirmed in a larger number of patients (specifically BS patients), the HCT test might easily allow differentiation of GS from BS of any type, especially BS type III, the condition most likely to overlap with the GS phenotype. We did not find in our patients with GS any apparent correlation between quantitative response to HCT and type of mutations (missense rather than nonsense or frameshift) or with plasma K and Mg levels, urine Ca excretion, or severity of clinical symptoms. Several explanations may be envisaged for these observations: It is difficult to predict the effects of any type of mutations (missense, nonsense, frameshift, or splice site) on the protein fate (protein synthesis, intrinsic activity, routing, or membrane expression) (32,33). In addition, in vivo compensatory adaptations in other transport mechanisms may occur along the nephron in response to chronic inactivation/inhibition of a single transport system, as well described for long-term administration of diuretics (31). In this context, of great interest is the enhanced response to HCT in most patients with a Henle's loop defect and the two patients with abuse of the Henle's loop diuretic furosemide. Enhanced HCT effect suggests a compensatory hyper-reabsorption of tubular fluid in sites past the loop of Henle, specifically the distal convoluted tubule, where thiazides exert their diuretic action. This is well known to occur in long-term use of loop diuretics and is the basis for concurrent thiazide and loop diuretic use in severe edematous disorders (34,35). Irrespective of its explanation, enhanced HCT effect in patients with hypokalemia and alkalosis is a clue to the diagnosis of a Henle's loop defect or concealed intake of a loop diuretic. Our two patients with BS type III seemed to have a lower HCT response (within the high-normal range) than patients with BS type I. This might be in keeping with the suggestion by others (36) that CLCNKB mutations might secondarily impair NaCl reabsorption also at the thiazide carrier level; this is because the CLC-Kb channel might be the main basolateral chloride exit route in distal convoluted tubule as well as Henle's loop cells, as demonstrated for the homologous CLC-K2 channel in mouse (37). Inactivating mutations of CLCNKB in BS type III might impair chloride exit from the cells and NaCl reabsorption from the tubule lumen both in Henle's loop and in thiazide-sensitive sites. Our data showing lower than expected NaCl reabsorption in thiazide-sensitive sites in BS type III might be an indirect confirmation that mouse data hold true also for humans; in addition, they suggest that normal HCT response might differentiate BS type III from both other types of BS (with higher test responses) and GS (with blunted response). A larger number of patients with BS type III are certainly needed to confirm the specificity of HCT effects in BS type III in relation to both other types of BS and GS. Extensive use of the thiazide test in the diagnosis of renal tubular hypokalemic disorders may have practical limitations: It may not be feasible in very young children, who are unable to comply with urine collections; also, in patients who are already under treatment with high-dosage antiprostaglandin or antialdosterone drugs and for whom treatment withdrawal might be poorly acceptable, the test cannot be recommended because we have not tested how and how much HCT effect may be affected by other drugs that act on tubular reabsorptive processes. In these instances, direct genetic testing seems preferable. Also in patients with surreptitious thiazide intake, one might anticipate unpredictable results to our HCT test. Although we did not observe adverse symptoms in our patients, patients with Henle's loop defect (whose fluid homeostasis largely depends on the distal convoluted tubule function) should be carefully watched for signs of acute volume depletion. We have shown that the response to a standard dosage of HCT is blunted in patients with GS but not in patients with mutations of Henle's loop transporters/channels or with nongenetic hypokalemia. In patients with the highly selected phenotype of normotensive hypokalemic alkalosis, reduced HCT test results allow prediction with a very high sensitivity and specificity of the GS genotype, so we plan in prospect to avoid genotyping patients with reduced HCT test and a phenotype consistent with GS. In occasional patients with GS phenotype and normal or high HCT test result, we would examine as a first option the CLCNKB gene; in patients with equivocal phenotype and very high response to HCT test, we would perform a diuretic screen (at least in adults) before undergoing genotyping. We thank the “Associazione per il Bambino Nefropatico” for financial support for molecular genetics evaluations.